Hedgehogs are small creatures with big appetites! Feed the hungry hogs in your garden to help them build the energy they need when raising hoglets, and their fat reserves for their long winter hibernation. One way to do this is to build a feeding station in your garden with lots of hedgehog-friendly food and water! Why not stock your hedgehog cafe with Spike's dry hedgehog food? 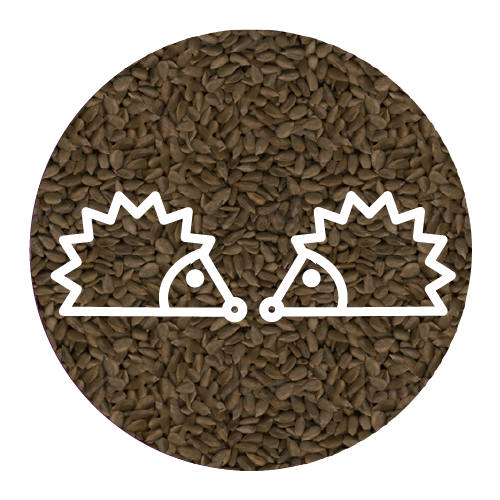 Hedgehog food is designed as a supplement to a hedgehog's natural diet. Find a safe place for your cafe. It should be in a quiet, sheltered and safe spot. Of course, hedgehogs need to be able to get in and out of your garden to start with, so if that isn't yet the case, start by creating nature's highways and byways. Get a sturdy box (wood or plastic) with a removable lid for your feeding station. It needs to be big enough for a hedgehog to fit through, but not a cat or fox. Create a hedgehog-sized hole at the base of one of the sides of your box. It should be about 13cm square so the hog can get in and out safely. If your box is wooden, you’ll need a saw. If your box is plastic, carefully use a sharp knife. Cover the edges of the hole with duct tape to make sure there are no sharp bits that could hurt your hedgehogs. Add your grub. Line the box with newspaper and dry leaves. Hedgehogs prefer small-sized leaves such as birch, oak and hazel. As the sun goes down lay shallow dishes of hedgehog-friendly food and water inside the box. Make sure you don’t put out too much food, as it’s not good to have leftovers lying around. Put out a little to start with. If your cafe is popular, you can gradually increase the amount on the menu. Add your roof. Put the lid on top of the box and place a brick or two on top of the lid. This will stop a fox tipping the box up or dragging it away. Clear away any leftovers in the morning and refill your dishes every evening. But be vigilant - if you think that anything other than a hedgehog is eating the food, stop feeding. Time to watch. Very quietly as the sun goes down, go out and sit somewhere within view of the box and hopefully you'll be rewarded with a view of this snuffling, grunting little beauty. Next why not give a hog a home?